A rite of passage is a ritual event that marks a person’s progress from one status to another throughout his or her life. In Tamil culture these start before the birth of the baby, and extend past a person’s death. These Rites are also celebrated for the building of a house, in this case marking the stages of building the house. The Tamils celebrate before and after the baby is born, when the infant grows into a child, when the child comes of age, when the young adult marries, when they die, and after they die. In all of these celebrations the individual is held in the heart of the family. The family is your root and your strength. For the Tamil to leave and be outside the framework of the family is most difficult, but this does happen as children now move to a big city or overseas to work. If you understand about their family, You will understand Tamils more deeply through understanding their rites of passage. In the West, we have largely lost these celebrations. I think we are the poorer for this loss. Tamil superstitions shape life for pregnant women. They are not supposed to cross a river or climb a hill during pregnancy. During the fifth or seventh month of their pregnancy, women receive bangles or bracelets from their husband’s families. After the baby is born, naming and hair-shaving ceremonies are performed. Customs marking the coming of age of children vary. When a girl reaches puberty, Tamils celebrate with a feast. Tamil tradition requires people to avoid saying that a person is dead. Instead, the person is said to have reached the world of Lord Shiva, to have attained a position in heaven, or to have reached the world of the dead. Tamils cremate or bury the dead, with burial being more common among lower castes. The body is prepared for the funeral by being washed, perfumed, and dressed in new clothes. Families observe the anniversary of a death by gathering together, giving gifts to priests, and feeding the poor. 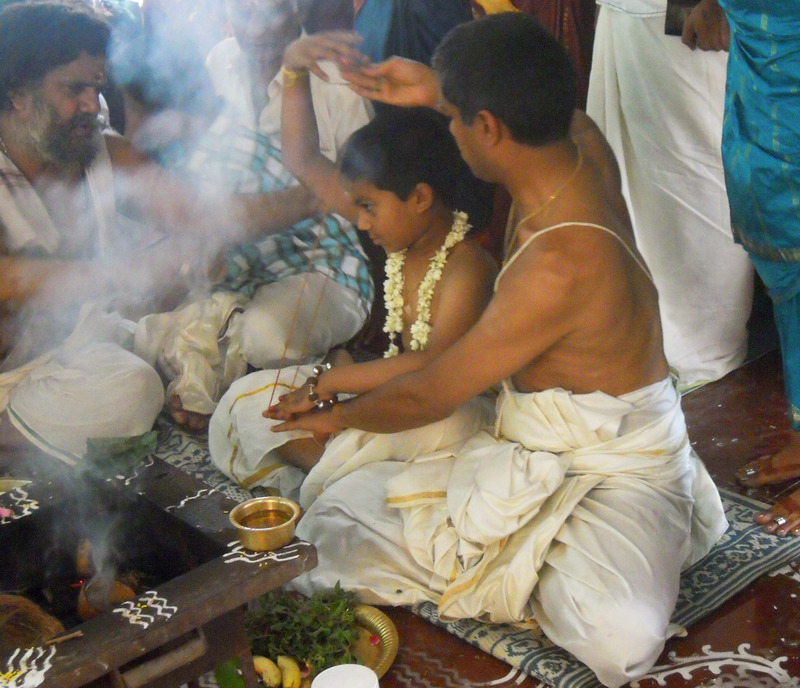 There are differences in the way that a Tamil Brahmin family will celebrate these life stages. For example, they have additional milestones, like the start of formal schooling or the wearing of the sacred thread, which are celebrated. 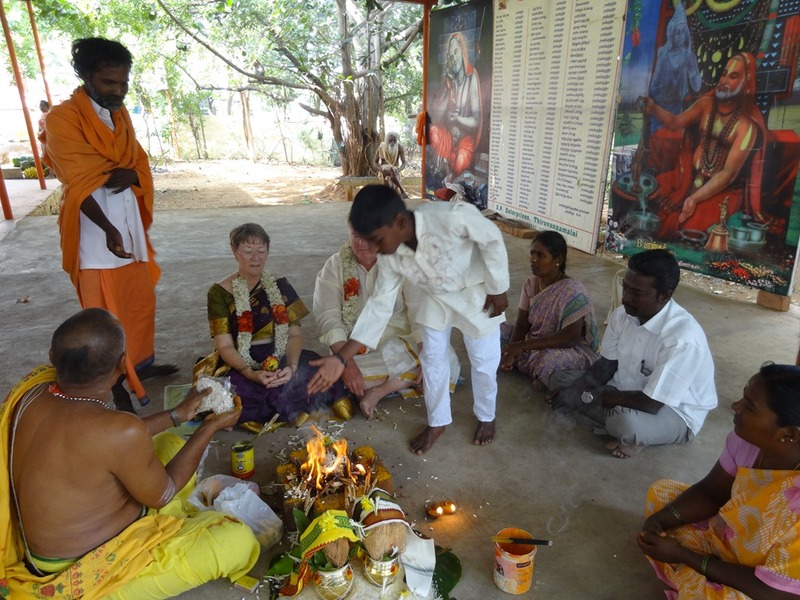 Their rituals are also more formal, with prescribed offerings and chanting, etc. Tamil families are strong, and in them everybody knows their place, and that they are loved. Many would say that the strength of the family is what drives Tamil culture. These rites of passage are one element in this. In America, where we come from, these rites are not as universally present, and I think we are at a loss due to their lack, and that the family and family member suffers from their absence. This is one reason that I find these rites so interesting and valuable. We have been privileged to be invited to attend a number of these ceremonies, most of which I think were for lower caste Tamils, not Brahmins. Several are for Westerners treated as Hindu. I have photographed these and made postings on this site. This page provides an easy-to-use guide to all these postings. I hope this will make them more useful and accessible to our readers. A special ceremony is held, either in the fifth, seventh, or ninth month of pregnancy. About two weeks after the birth of a new baby, a celebration is held to welcome the baby into the family and to give it its new name. Boys at around two have their first haircut. Girls at about three years of age have their ears pierced, and will always wear earrings thereafter. When a young woman has her first menstrual period, she is celebrated and welcomed into womanhood. Tamil Coming of Age – Manjal Neerattu Vizha shows a public function for the girl. 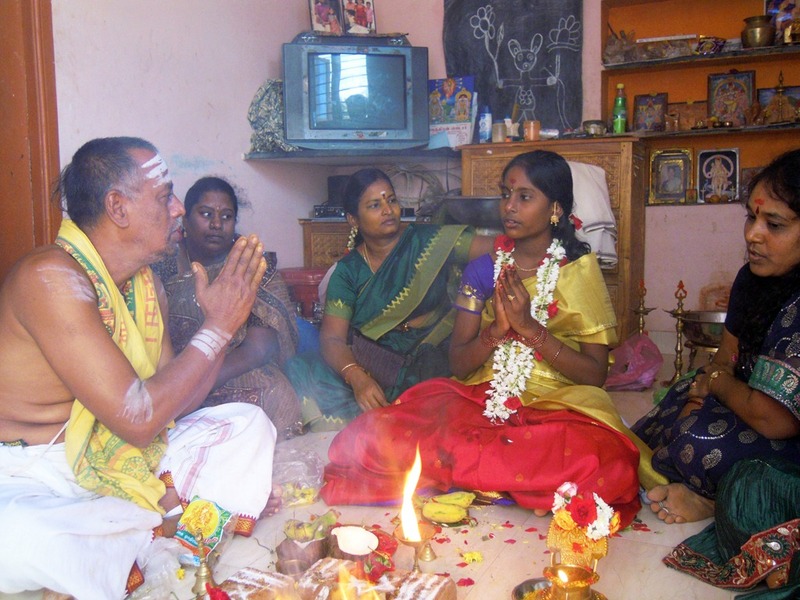 Age Attained Ceremony: a Girl becomes a Woman, Tiruvannamalai, a private function in the family home. The Tamil marriage is perhaps the most important of all the rites of passage. Usually the families will have spent months (or years) to find the right partners for their children. The weddings are elaborate and filled with symbolism. Immediately after death, usually within 24 hours, the body will be cleaned, decorated, and cremated. Interment of A Ramana into Samadhi This is how Hindu Saints are buried. After the cremation, the ashes are gathered and disposed of, usually in water. About two weeks after the funeral, another big event takes place. This event is timed so that family members who were not able to attend the cremation can come. One year after the funeral, there is another special ritual, celebrating the deceased. Like for the people in a family, celebrations, really Rites of Passages, are performed for the construction of a new family home. Like all Rites of Passages, these are family celebrations that mark a change is status. The rites commemorate home building stages from initially securing permission from the Earth Goddess Bhoomi, to the final blessing of good fortune from Ganesh. These are all for the same home, built by Rajan for his family. 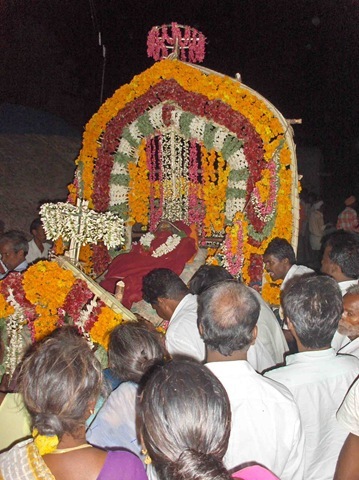 To see other posts that you may be interested in, follow this link: Festivals, Celebrations and Rites in Tiruvannamalai. This entry was posted on January 13, 2012 at 4:13 pm and is filed under Festivals, Celebrations and Rites, Life in South India, Rites of Passage, Tamil Nadu, Tiruvannamalai, Village life. You can follow any responses to this entry through the RSS 2.0 feed. You can leave a response, or trackback from your own site. I’m interested if there are any “rites of passage” ceremonies at age 6 7 or 8 or are these ages part of another ceremonial rite and what title would these younger participants have if they are not central to the ceremony? Thanks. Research material….